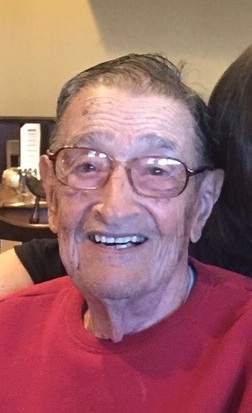 Obituary for John Fernandes Castro | George C. Lima Funeral Home, Inc.
John Fernandes Castro, 98, of Justin Street and formerly of Mt. Hope Avenue, passed away on February 2, 2019 at home. He was the husband of the late Helen (Martin) Castro. Born in Santo Antonio, Madeira, he was the son of the late Manuel Fernandes Castro and Guilhermina A. (Gouviea) Castro. He is survived by his children John Castro and his wife Carol of Marshfield MA and Arlene Weber (the late Edward “Buddy” Weber) of Bristol; grandsons Christopher J. Castro, Brian D. Castro and great-grandson Braden J. Castro. He was the brother of the late Vasco Castro, Maria Rosalia Nunes, Maria Jose Castro, Amelia Ferreira, Maria Augusta Castro, Maria Rosaria Andrade, Joseph Castro, Manuel Castro and Mary C. Andrade. Mr. Castro attended Bristol schools and was a machine operator for Converse for many years before retiring. He was a Sergeant in the US Army Armored Division in the Pacific where he earned the Bronze Star. He was a member of the Portuguese Independent Band Club for 80 years and loved golfing with his friends and nephew. Calling hours are Thursday, February 7th, 8:30 – 10:30 AM at the George Lima Funeral Home 367 High Street followed by a Mass of Christian Burial, 11:00 AM at St. Elizabeth’s Church 577 Wood Street. Burial will follow in St. Mary’s Cemetery. In lieu of flowers memorial donations may be made to: Beacon Hospice 1 Catamore Blvd, East Providence RI 02914 or RI Veterans Home 480 Metacom Avenue, Bristol RI 02809.